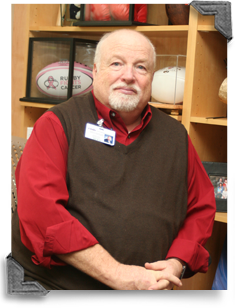 Robert McMillan, MSW, LSW, BCD, OSW-C, director of oncology support services at the Carrie J. Babb Cancer Center (CJBCC) at Citizens Memorial Hospital was recently featured in the AOSW Navigator, a national publication of the Association of Oncology Social Work. McMillan has served as the director of the CJBCC for 11 years and has been employed at CMH for 30 years. Prior to working at the Cancer Center, McMillan was the administrator at CMH Colonial Springs Healthcare Center in Buffalo and a social worker in the hospital.